Alzheimer’s accounts for 60-80% of dementia cases in the U.S. Vascular dementia accounts for up to 40% of dementia cases. Huntington’s disease, Parkinson’s disease and Creutzfeldt-Jakob disease are less common causes of dementia, the Alzheimer’s Association reports. Different forms of dementia have different early symptoms, progression and treatment options. Understanding those differences will help you identify early symptoms and plan for future care needs. First and foremost, understanding the differences between Alzheimer's and different forms of dementia will help you recognize symptoms of underlying diseases sooner. Research shows that early identification leads to faster medical intervention and treatment, which leads to better outcomes for you or your loved one. Additionally, cracking the dementia vs Alzheimer’s code enables you to understand how different forms of dementia progress. That will help you make decisions about appropriate treatment and memory care. 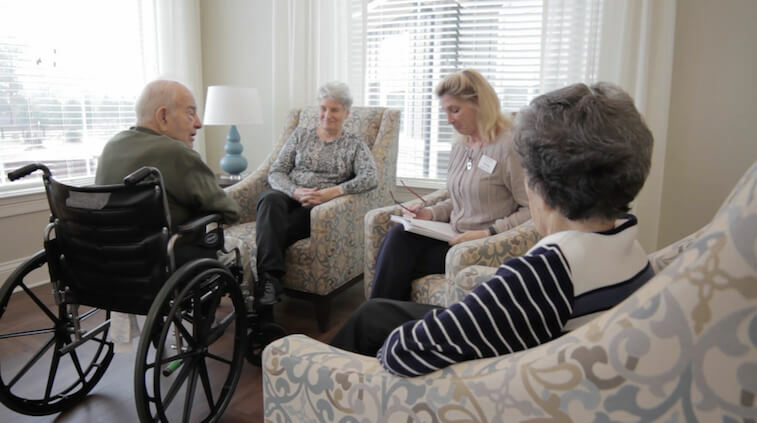 Family caregivers with a clear understanding of dementia experience more comfort and acceptance as their loved one progresses into the later phases of dementia, research shows. This helps them understand what their loved one is experiencing, and why they’re sometimes exhibiting uncharacteristic behaviors. It’s generally accepted that Alzheimer’s is caused by changes in the brain that can take place over decades before outward symptoms appear. These changes could be brought on by genetic, environmental or lifestyle factors — but the exact cause of Alzheimer’s is unknown. And, while 95% of individuals with Alzheimer’s are older than 60, early onset Alzheimer’s — or familial Alzheimer's disease (FAD) — also occurs in people who are 30 to 60 years old. FAD is often inherited, but again, the cause of FAD is a mystery for some who are diagnosed, according to the National Institutes of Aging. Difficulty with short-term memory is the first outward symptom of Alzheimer’s. As Alzheimer’s progresses into the middle phases, difficulty communicating, confusion, disorientation, sunsetting, wandering and behavioral changes often result. Difficulty speaking, walking, breathing and swallowing are common in later stages of the disease. There is no cure for Alzheimer’s disease. However, drug and non-drug treatments can help address cognitive and behavioral symptoms of the disease. The Alzheimer’s Association continues to support research toward new treatments that will alter the progression of Alzheimer's. Vascular Dementia is caused by hardened or damaged blood vessels and arteries in the brain failing to deliver needed oxygen and nutrients. Stroke is the most common cause, but vascular dementia can be caused by any condition that damages blood vessels and reduces circulation. While short-term memory loss is often the first sign of Alzheimer’s, this not the case with vascular dementia. Early signs include difficulty making decisions, concentrating, following instructions, planning and managing money. Problems with memory, agitation and psychosis can follow those milder symptoms, according to the Mayo Clinic. Treatment for vascular dementia often centers on preventing future strokes. Drug treatments are typically used to treat underlying diseases that result in vascular dementia like hypertension, hyperlipidemia and diabetes. Drugs used to treat cognitive symptoms of Alzheimer’s have also proven effective in treating cognitive symptoms of vascular dementia. Understanding the difference between Alzheimer’s Disease and other types of dementia can be critical to your or your loved one’s care. Don’t hesitate to ask your doctor more questions about the differences between the different types of dementia.